The past (old radio collection, turntable) meets the future in the presence of KVMR's revamped control room for the Nevada City station's online kvmrx.org audio stream, which is celebrating its first anniversary in April. WHERE: The Crazy Horse Saloon, 238 Commercial Street, downtown Nevada City. It wasn’t an April Fools’ Day prank a year ago after all. That’s the day KVMR started its off-the-dial online streaming service at kvmrx.org — designed to attract a new and younger demographic to the community radio station. 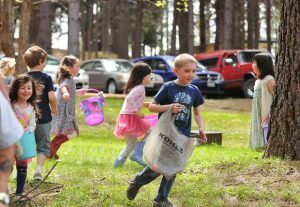 “Hey, it’s sort of an April Fools joke that’s just kept on going and growing,” said KVMR 89.5 FM Music Director Sean Dooley-Miller with a laugh. Yup, 365 days this coming Saturday, almost always 24 hours a day, KVMRx observes its first full year online and then holds its first anniversary celebration with live deejays spinning wax, plus live music with Brandy Robinson & Midnight Sol, at 8 p.m. Thursday, April 12, at the Crazy Horse Saloon & Grill in downtown Nevada City. 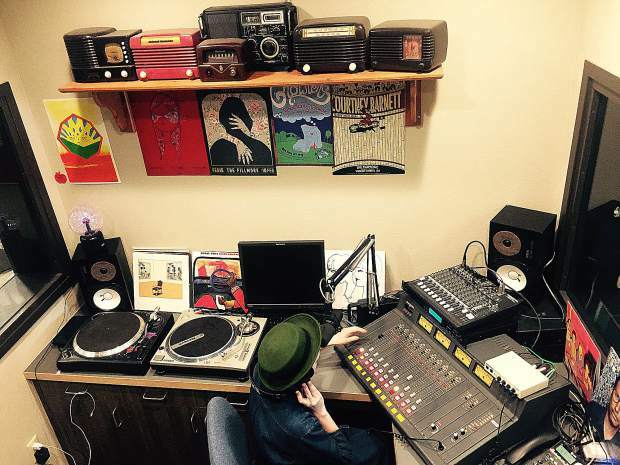 Dooley has been heading up the stream-only musical experiment, which some have been calling future of the Nevada City community radio station. And in just a year’s time, KVMRx has made a major impact on the airwaves both locally and globally. 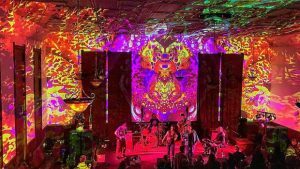 KVMR’s online listeners — here and elsewhere — were suddenly gifted with many more options for creative programming curated by some of the more creative audiophiles around, many of them decades younger than the current over-the-air broadcaster crop. The whole thing came around when KVMR officials had decided to launch a second stream. They met with different groups of broadcasters, including one with millennials and Gen-Xers, “who’d been part of local art culture but were interested in having an outlet where generations that age, only marginally represented on KVMR, could craft a show right out of the gate,” according to the 28-year-old Dooley. And they did it, with over a dozen starting out their radio dreams in those early weeks. Now the number of broadcasters — or would it be webcasters? — has doubled. Genres, and musical styles, have definitely expanded, too, noted Dooley. “A lot of the shows that started last April have evolved to be something completely different than what started out to be,” he said. Shows are broadcast from a makeshift studio (a former control room) that has been decorated with lamps, posters, album covers and, ahem, a younger attitude. DJ Sugar Troll runs the “Sugar Shack” 4-6 p.m. Mondays. Tuesday includes “Totally Derailed” with Just Jess at 6 p.m. and “Come Up Screaming!” featuring the SaeHey Kid (9 p.m. to midnight). Wednesday includes “Jive A.F.” with Captain Save-A-Show at 4 p.m.
Thursdays at 2 p.m., The Guitar Mama holds “Groove Sessions”, with Dr. Bad Weird hosting “Creature Feature” at 8 p.m.
And then there’s the late night “Peter Out” with Dippy Twinkletoes and Saturday’s “No Banjos Required” as a counter to KVMR 89.5 FM’s bluegrass and roots programming that day. Right now, KVMRx is free of station IDs, promos, business supporter announcements and even terrestrial radio language requirements because the station is only available online. That may also change in the future, but it’s increased the creativity flow, according to Dooley. “Leaving shows in this open format has helped people to redefine their idea of what a radio show can be and can do,” he said. Meanwhile, the application deadline for KVMR’s 2018 Broadcaster Training Class is coming right up. Applications must be received by the end of day, Monday, April 2nd. The class — which gives members of the public a chance to become a certified KVMR broadcaster — takes place 9 a.m. to 3 p.m. Saturday, April 21 and April 28, at the KVMR Miss Rumphius Community Room in the station’s new building, 120 Bridge Street at Spring Street, downtown Nevada City. Applications are available at the station weekdays 9 a.m. to 5 p.m. and are also available online at kvmr.org by clicking on “Broadcaster Training Class” in the Events section of the community radio station’s home page. For more information call 530-265-9073.